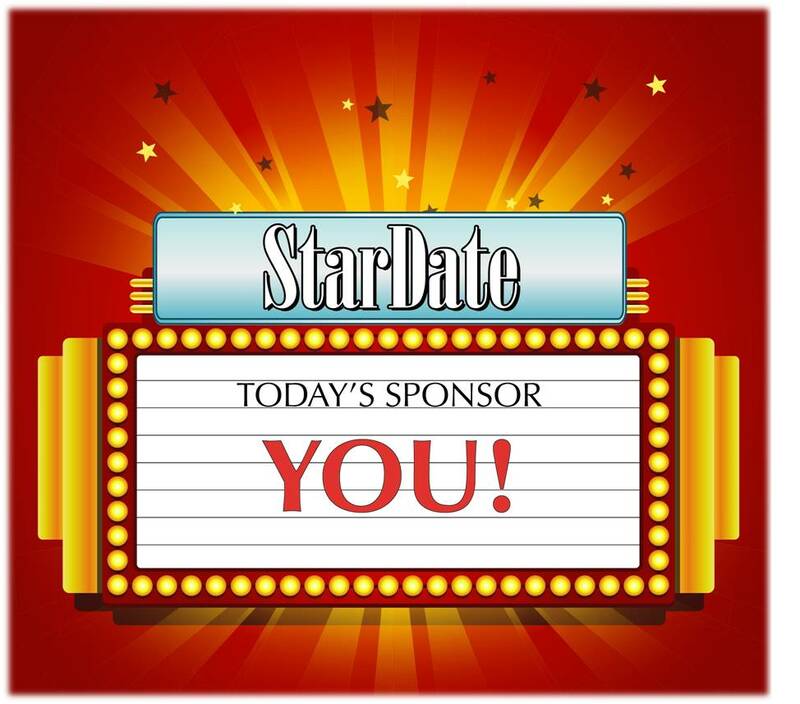 Sponsor StarDate for a Day and be Recognized Coast-to-Coast! Become a star yourself, and support cosmic understanding, by sponsoring StarDate for a day! Our narrator, Sandy Wood, will announce your name as sponsor of an episode heard across America--and beyond--by more than 750,000 people on our nearly 350+ radio stations and thousands of podcast downloads. Plus, you’ll be recognized as a sponsor in an issue of StarDate magazine, and for your day on our stardate.org website. We will acknowledge your contribution in writing as a donation to the The University of Texas at Austin. Your donation may be tax deductible. When you enroll as a sponsor for one or more days, we will send you an email to let you know when your sponsored episode will be on the air. And you'll receive by email an audio copy of your sponsored episode, which you’re free to share with family and friends. You’ll also receive a certificate honoring your sponsorship and a copy of the issue of StarDate magazine in which your name appears. We have only 365 daily sponsorship opportunities per year — 366 during leap years! — so don’t hesitate to reserve your spot. We accept sponsorships for a year in advance of the current date. Your sponsorship message (words our narrator will speak in your episode) from the following options * - Select -Today’s program was made possible in part by [Your Name], supporting research and outreach at McDonald Observatory.Our program today was made possible in part by [Your Name], supporting science literacy for all Americans.Today’s program was made possible by [Your Name], supporting science education and outreach at McDonald Observatory.Today’s program was made possible in part by [Your Name], encouraging everyone to support dark skies.Our program today was made possible in part by [Your Name], supporting science education for all Americans.Today’s program was made possible in part by [Your Name], supporting science education for all Americans.Today’s program was made possible in part by [Your Name], supporting science education for students everywhere.Our program today was made possible in part by [Your Name], supporting dark skies for all stargazers.Today’s program was made possible in part by [Your Name], thanking [science] teachers everywhere for their work.Today’s program was made possible in part by [Your Name], encouraging a new generation to reach for the stars.Today’s program was made possible in part by [Your Name], supporting research that expands our frontiers.Our program today was made possible in part by [Your Name], sharing the wonders of the universe.Today’s program was made possible in part by [Your Name], supporting science education and research.Today’s program was made possible in part by [Your Name], promoting the value of scientific research and discovery.Our program today was made possible in part by [Your Name], sharing the love of science and discovery.